We offer attended migrations of your existing For Your Server data to Manuscript On Premises, typically during our normal business hours (9AM to 5PM Eastern, Monday to Friday). If you’d prefer to migrate your data yourself, great! The following outlines that process, with minimal help from us. Please note that this document applies to customers already using SQL Server. To import a MySQL database, you’ll need to first convert to SQL Server. With proper preparation, migrating data to Manuscript On Premises can be accomplished with minimal downtime. Make sure a SQL Server backup of the FogBugz For Your Server database is available locally on the Manuscript On Premises database server. For reduced downtime, we recommend moving the FYS database to your new server before the migration to On Premises. Install Manuscript On Premises. For reduced downtime, do this ahead of your migration date. Restore the FogBugz For Your Server SQL Server backup over the top of the appropriate Manuscript On Premises database (see below) — or simply rename the databases if they are on the same server already.If this is the first site you are migrating data for, you’ll want to restore your For Your Server data over the trial1 database (the trial number will be different if you have multiple Manuscript sites running on the same server). If this is an additional site that is being migrated in addition to an existing site in Manuscript On Premises, the database name will be trial2 or higher — the highest trial number is the most recently configured site. Ensure the Manuscript On Premises database user is mapped as db_owner on the new trial database. If this is a test instance, we recommend sanitizing the database to avoid interactions with your production instance. Start IIS on the Manuscript On Premises web server, and allow the database to be automatically upgraded. Select the dropdown in the row labeled “SelfServiceSchemaFix” and choose “Force Enable” and click the “Update” button — if you don’t see this row, you can proceed to the next step. On the resulting page, click the “Back to Schema Check” button. If there are still errors on the page, contact us. Start ES backfills by navigating to <your Manuscript URL>/f/debug/es from the Manuscript web server (you’ll get 403s from external machines). You may see an alert that says “Alias not found”. If that’s the case, click the button below it that says “Create ES Alias”. 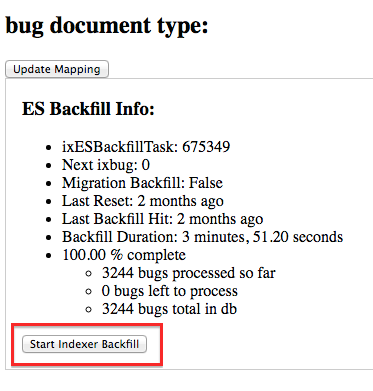 Click the “Start Indexer Backfill” button for each document type (bug, wikipage, and discusstopic). If you have any questions or would like assistance with this process, please don’t hesitate to contact us. We’re happy to help!